: Scenthound used by hunters with or without guns, of large game, stag, roe-deer, wild boar, fox, generally in a pack or individually as a limer (dog held on a lead and used for picking up a cold trail). : Initially only the Grand Vendéen existed. It was a short-haired variety of Vendéen descending from the « Greffier » (Early 16th century - Translator’s note.) or from the so-called « King ’s white hound »*. 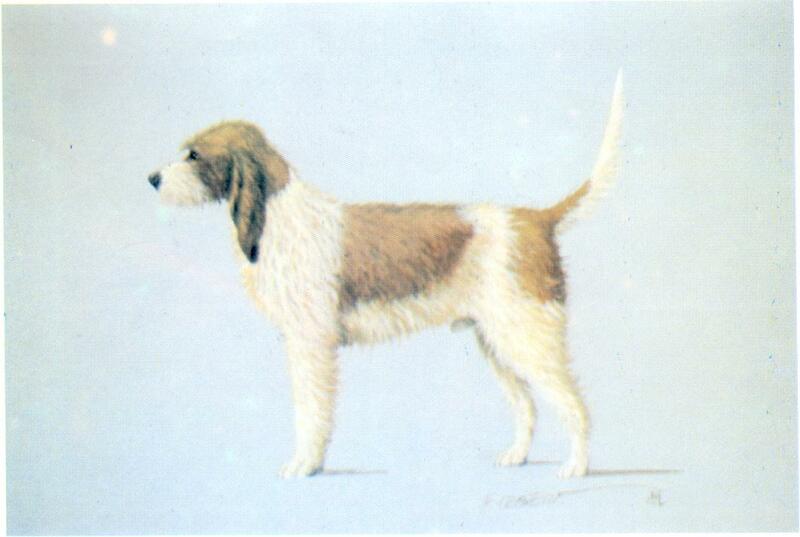 Neither should we forget mentioning the « griffon fauve de Bretagne » in its origins because the former enters for an important part into the bloodlines of the « Greffier ». The « Chien Gris de St. Louis » and the « Griffon de Bresse » (descendant of Segusian ancestors) brought as well their contribution to the creation of the Grand Griffon. : A very old breed, French in type, receptive and determined, distinguished in its shapes and gaits. Well proportioned construction, robust without heaviness. : Behaviour: Fine nose, has a beautiful voice; assiduous on the track, does not refuse thorny undergrowth, needs large territories. Temperament: Docile, but wilful and passionate, needs to be kept well in hand. : Seen from the front, rather well domed, but not too wide between the leathers. : Strong, black except for white and orange coats where a brown nose is tolerated; nostrils well open. : Of equal length to that of the skull, strong, straight or slightly convex. : Pendulous flews covering well the lower jaw and giving the front of the muzzle a square profile; they are well covered with moustaches. : Dark colour, large and bright, the eyebrows well pronounced but not covering the eye. The conjunctiva must not be apparent. : Typical of a French scenthound, they are supple, narrow and fine, covered with long hair and ending in an elongated oval, well turned inwards; low set below the level of the eye, they must be able to reach beyond the end of the nose. : Solid, straight or rising very slightly. : Chest: Not too wide, quite deep, reaching elbow level. Ribs: Moderately rounded and long. : Rather dawn up but well filled. : Thick at the base, tapering progressively, set high, carried as sabre tail, but never as a sickle; rather long. : Long, lean and oblique. : Strong bone construction, straight. : Not too strong, pads hard, the toes well arched and tight, the nails solid. A good pigmentation of pads and nails is desirable. : Hip bones solid. Apparent. : Broad and well let down; seen from the rear, neither cow-hocked nor bandy-legged; seen in profile angle of hock moderate. : Not too fine, supple. Often marbled in the tricolour subjects. No dewlap. : Long without exaggeration, sometimes bushy and harsh (coarse and hard); undercoat dense; the belly and the inside of the thighs must not be bare; eyebrows well pronounced but not covering the eye. : Black with white spotting (white and black). Black with tan markings (black and tan). Black with light tan markings. Fawn with white spotting (white and orange). Fawn with black mantle and white spotting (tricolour). Fawn with black overlay. Pale fawn with black overlay and white spotting. Pale fawn with black overlay. Traditional name hare colour, wolf colour, badger colour or wild boar colour. Male from 62 cm to 68 cm. Female from 60 cm to 65 cm. Head: Too short. Flat skull. Muzzle short. Depigmentation of the nose, lips or eyelids. Pincer bite. Light eye. Leathers set high, short, insufficiently turned in or lacking hair. Body: Lacking volume. Appearance too heavy. Topline not firm enough. Croup falling away. Limbs: Insufficient bone. Angulation too straight. Hocks too close. Slack in pasterns. Hair: Insufficiently dense, fine hair. Wall eye. Eye of different colours (Heterochromia). Lack of space in the sternal region; ribs too narrow towards the lower end. Self coloured coat black or white.